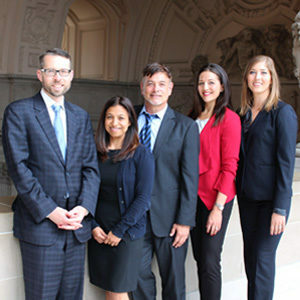 The team that secured a sweeping order and tough injunction against landlord Anne Kihagi, from left to right: Neighborhood and Residential Safety Division Chief Attorney Peter Keith, Neighborhood and Residential Safety Division Paralegal Carolina Reyes-Ouk, and Deputy City Attorneys Michael Weiss, Megan Cesare-Eastman and Victoria Weatherford. SAN FRANCISCO (May 3, 2017)—City Attorney Dennis Herrera today announced he had secured a sweeping tentative ruling against a notorious landlord and her accomplices for waging a ruthless war to illegally force tenants from their rent-controlled homes so she could charge more money. The decision, subject to only minor clerical corrections before it becomes permanent, places court-ordered constraints on the landlord, Anne Kihagi, and nullifies all pending evictions she is pursuing, such as one on a Guerrero Street property that is home to several seniors and a person with a medical disability. Herrera filed a lawsuit against Kihagi and her associates in June 2015 for her egregious pattern of unlawful business practices that includes waging “a war of harassment, intimidation, and retaliation” against her tenants. Once forced from their homes, Kihagi routinely ordered unpermitted construction work before re-renting the uninspected and potentially dangerous apartments to unsuspecting new tenants at vastly higher rents. Kihagi started buying properties in June 2013 in Noe Valley, the Castro, the Mission and North Beach, amassing at least 10 buildings in San Francisco. This was after a similar campaign of illegal evictions and harassment against rent-controlled tenants in West Hollywood, California. Last week, a Southern California judge found Kihagi in contempt of court and ordered her to spend five days in jail. The 154-page tentative decision from San Francisco Superior Court Judge Angela Bradstreet ruled in favor of the San Francisco on every count, voiding all evictions pending as of Jan. 12, 2017 and awarding almost $2.4 million in penalties. Judge Bradstreet also ordered the defendants to pay the city’s investigative costs and attorneys fees that remain to be totaled but are expected to run into the millions. In her ruling, the judge denounced the illegal conduct of Kihagi and her accomplices in stark and powerful terms. “The record is replete with outrageous, unlawful, and fraudulent violations that were specifically targeted against often long term tenants who were protected by San Francisco’s rent control laws,” Bradstreet wrote. Kihagi, the judge found, told one tenant she was smiling because “I am going to be happy when your grandmother is dead,” and engaged in personal attacks against another tenant in a direct and calculated attack on her health to force her to vacate her apartment, knowing that she suffered from anxiety and panic attacks. 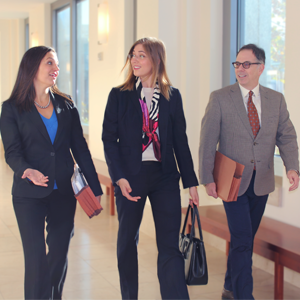 Deputy City Attorneys Megan Cesare-Eastman, Victoria Weatherford and Tom Lakritz walk into Dec. 15 2015 hearing in which the court rejected Kihagi’s bid to derail Herrera’s lawsuit. The ruling is also a validation of the city’s Department of Building Inspection, which documented scores of violations at Ms. Kihagi’s properties. The court found that the buildings were, collectively, noncompliant with state and municipal law for at least 4,487 days. About $1.1 million of the nearly $2.4 million in penalties were for building code violations alone. The court found another 1,251 violations of the state’s unfair competition law. The tentative decision was issued after a nearly three-month bench trial. The case is: City and County of San Francisco and People of the State of California v. Anne Kihagi et al., San Francisco Superior Court No. 15-546152, filed June 4, 2015. Additional information on the San Francisco City Attorney’s office is available at: https://www.sfcityattorney.org/.